Stepping Into Science introduces students to concepts and processes of experimentation. The kit includes 25 hands-on experiments along with a 48-page guidebook. Ages: 5+. 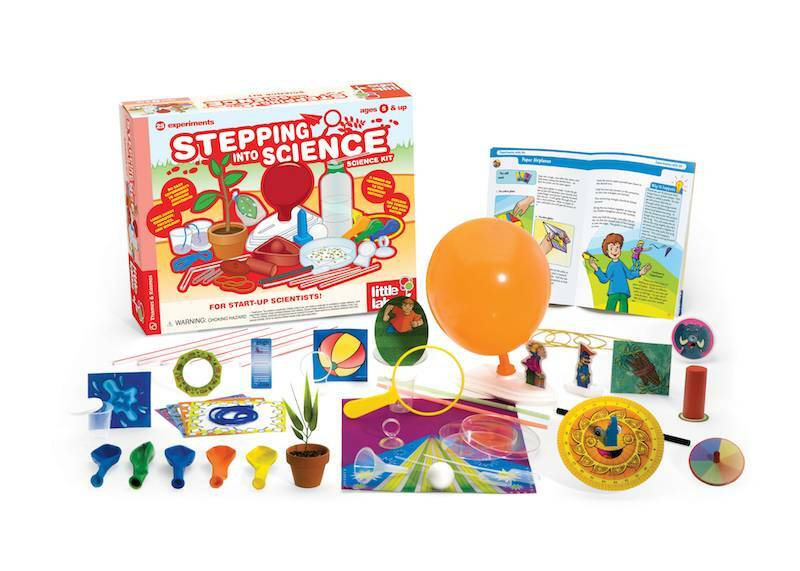 Begin a lifetime of scientific investigation and understanding with 25 fun experiments in five key areas: nature, physics, chemistry, air, and water. Learn what plants need to grow, build a barometer, see how water climbs, watch plants sweat, and investigate plant propagation. Discover how a magnifying glass enlarges, how colors mix, how static electricity attracts, how sundials tell time, and how a motion picture works. Investigate air pressure, air flow, hovercraft, paper airplanes, and suction. Write secret messages, float a paper clip, blow super bubbles, observe capillary action, and test displacement. Build a soap-driven boat, mix oil and water, experiment with evaporation, paint with sugar, and watch a balloon inflate itself. With a 48-page guidebook, Stepping into Science teaches science fundamentals with step-by-step, hands-on experiments, while also introducing children to the scientific method itself.